Villages are an intrinsic part of the English countryside. They are associated in our minds with clean air, space, serenity and rustic rural beauty. Symondshyde provides a unique opportunity to plan comprehensively for new housing and new infrastructure, and to demonstrate a sustainable development for successive generations to enjoy. With a community centre, church, local pub, restaurant and country shops, Symondshyde is a far more ambitious plan than simply building a monoculture of circa 1,130 dormitory homes in the green belt. If adopted in the Local Plan, the village will offer a primary school for the education of local children and a retirement community for older people. 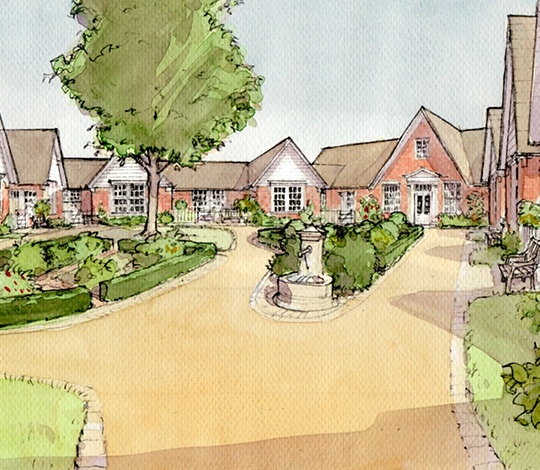 As a true village, built to follow in the best traditions of rural Hertfordshire, space will be allocated to facilitate horse livery, community allotments, and other outdoor amenities. There are no plans to harm the existing historic woodland. Mature trees and hedgerows across the rest of the site would remain. The site was studied in great detail prior to the commencement of any masterplannning. We believe, as planner Andres Duany has said, that “when green space is lost we lose something of value. We must make sure what we get in return is of equal value.” To this end, the masterplan for Symondshyde village has been specifically developed around the traces left on the ground by the past centuries of human habitation: bridle paths, streams, mature hedgerows and trees and other marks. Not only are these retained, but they dictate a natural shape, size and feel of the village. Small businesses are an essential component of any thriving village. The existing businesses at Symondshyde farm, for example the 3 Brewers of St Albans, are typical of the fabric from which any future village community might develop. Gascoyne Cecil are keen to embed businesses at the heart of any new development and are exploring what role present enterprise could play in an emerging Symondshyde village. Symondshyde is designed as a proper mixed-use community accommodating a full 30% affordable housing apportion required by Welwyn Hatfield Borough Council; small rural cottages, retirement apartments, starter homes as well as larger country houses. We are investigating how different governance structures, from community land trusts and Homeowners’ Associations to management companies and housing associations, might provide the opportunity for intelligent long term stewardship. Farming around Symondshyde would continue. Whilst the 56 hectares of the village site’s predominantly arable land would become lanes, homes, small businesses, community facilities and provide a variety of green space – grassy verges, a village green, wildlife habitats – the rest of the land around the village would continue to be farmed. There are many examples where villages and wildlife exist in harmony. Villages can offer space for ecosystems to form and wildlife to flourish. Whilst arable farming is largely a monoculture, the trees, hedges, grass verges, village green, individual gardens and community allotments, and small blocks of woodland and ponds offer potential for a more diverse ecological environment. 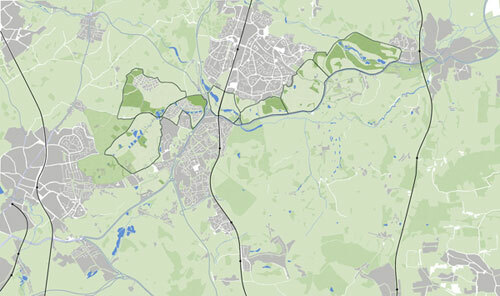 Our wider proposals include for a green corridor running east-west across Central Hertfordshire. This affords better opportunities for landscape and habitat management, improved access and connectivity for walkers, cyclists and equestrian uses. 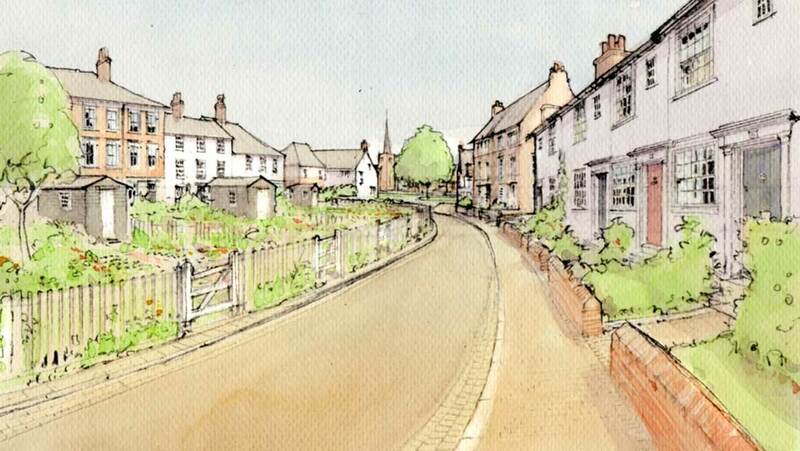 Symondshyde village has potential to become an attractive way point or destination within this network of routes. Part of our English tradition. We undertook extensive analysis of rural villages, including many within Hertfordshire. Our studies showed that villages are invariably scattered across the landscape between 1-4km in a patchwork of rural settlement and open space. The presence of favourable topography and mature woodland ensures that the new village would sit comfortably within its surroundings. Engagement and consultation has been broad. A timeline of the process to date appears below. Gascoyne Cecil launched its own development website which aims to inform the public of its general ethos and specific development aims. 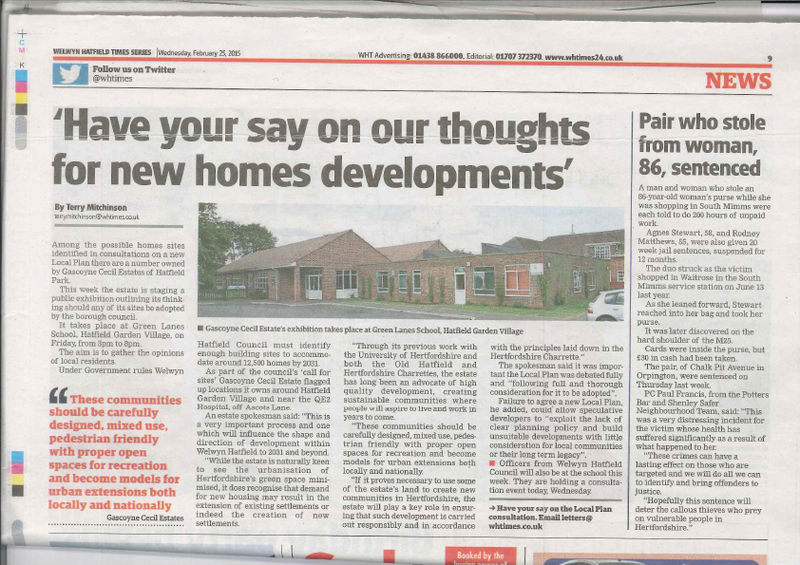 Gascoyne Cecil held a consultation on 27 Feb at Green Lanes school (the only really viable community facility around Hatfield Garden Village). 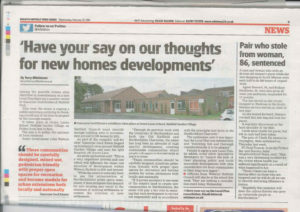 During this consultation period WHBC determined that more sites were needed in order to meet Objectively Assessed housing need. During this period, and Symondshyde was first submitted to WHBC as a prospective site and as a reponse to this further call for sites. WHBC Cabinet Housing and Planning Panel meeting discusses the new and amended sites. Symondshyde, included, was discussed here. Gascoyne Cecil Estates host a 9 day charrette – a participatory design process. 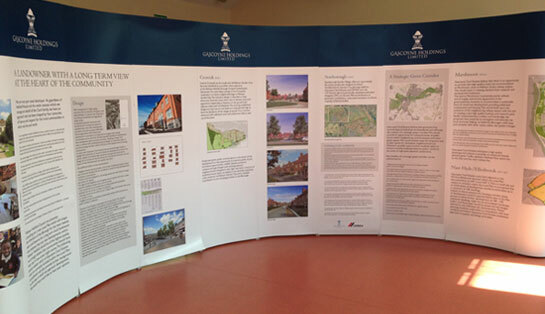 Inviting 1,500 members of Hatfield Garden Village, Green Lanes, Stanborough and around Symondshyde communities, several hundred people attend throughout the design process. The village masterplan evolves throughout this process, whilst important discussions about transport infrastructure, environmental consideration and community facilities are initiated with local residents, transport, community and design specialists and county, borough and town councillors. Cabinet Housing and Planning Panel meeting. 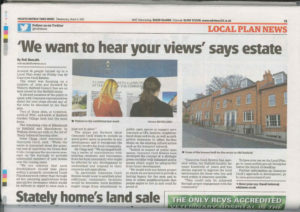 Councillors publicly discuss the draft Local Plan sites and vote to accept it prior to proceeding to public consultation. 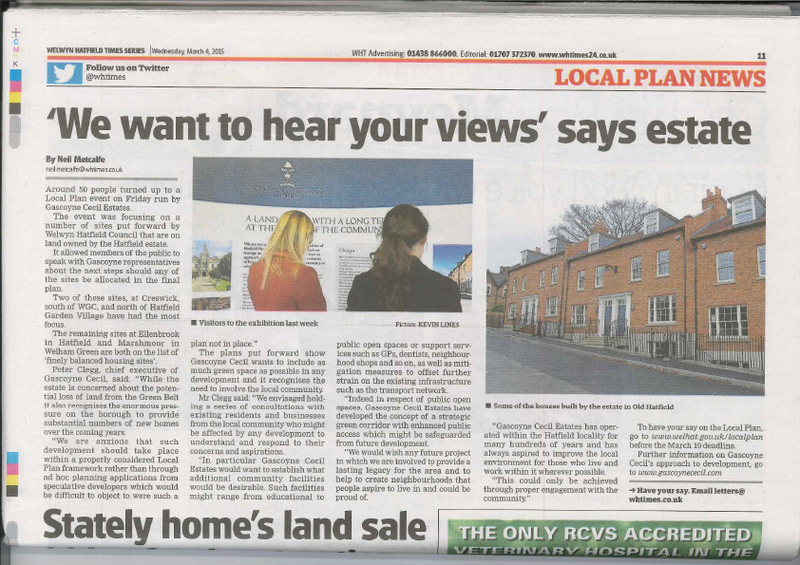 Another 8-week consultation process inviting the consideration by local residents of the draft Local Plan. Following this consultation period, the Council considered the formal responses, whether to alter the Plan, and ultimately submit it to the Secretary of State for Examination. An independent Public Examination by a government planning inspector began in 2017. The Inspector received all representations submitted during the public consultation stage. The Inspector is in the process of deciding whether the Plan is sound and should be adopted by the Council. If substantial changes are deemed necessary, further public consultation, followed by a subsequent examination, will be required. Time for the delivery of this Plan to government is short. Failure to achieve a viable Local Plan will invite a centrally-imposed Plan from government. Such a scenario is unlikely to serve the interests of local communities and in many ways would be the worst possible outcome.